• Bright orange pumpkin will add a pop of color wherever it’s placed. 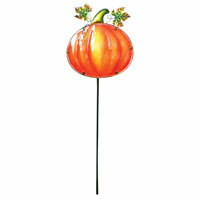 • Metal stake with glass Pumpkin shaped insert. • Stake measures 10.5” wide x 36” overall height. • Packed 12 per case, $7.80 each.